Today is "Spread the Word to End the Word Day". A day created by a couple of guys from the Special Olympics as a campaign to stop the use of the word "retarded". I think by now you all know how I feel about the use of that word...whether it's a joke, used as slang, chosen as a way to describe yourself or a thing...it's just not cool to use the word. Ever. I wrote about it a couple times before when it directly affected me in THIS post (which was really therapeutic to write)...and THIS one (which was after a very sad incident that cost me some friends). But no one can be more eloquent than my friend, Ellen, who writes over at Love That Max. If you haven't seen her blog - it's worth adding to your favorites every day. (Hint: she posts her blog close to midnight!! I should know...I used to wait up for it!) Today she posted a video that she created specifically for this day. I hope that you will take a three minutes and nine seconds to watch this and share it freely. This morning we were greeted bright and early by painters who are here to paint Brian's old room. This room will either become Gavin's new room - which would be great news as this would mean I would have a baby in his current room! Or this room will become a guest room - which would be cool if we ever had guests. Either way, I like the tan colored paint I chose to go with the blackwatch plaid curtains. 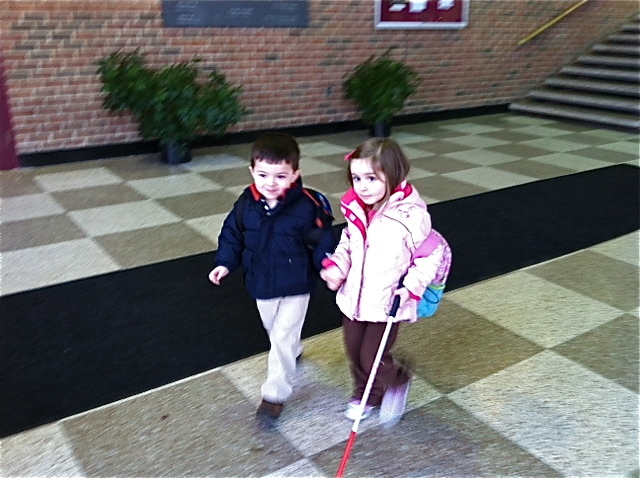 Next to arrive was Miss Stephanie for Gavin's Occupational Therapy! She always starts with trying to get Gavin to feed himself. He did a pretty good job, which shocked us all as he's been gagging a lot lately on his food. Congestion from his cold - and now seasonal allergies - are taking their toll on him. They moved to the table after that to work on fine motor activities and he charmed us all with his sweet smile. Brian is doing so well in school, but I'm always surprised when his teachers tell me he's very quiet! He's the exact opposite at home and is talking SO much more lately. All day long he is singing, asking questions, telling me stories, and identifying everything he sees. He loves school - and they love him - and he's still having a great time with his friend MacKenzie! I think Brian is also going through a growth spurt. He's been eating HUGE meals. For the last two or three nights he has had three helpings of dinner. He LOVES salad and finished an entire bag of Caesar (with no croutons) in two days. This afternoon, right after lunch, Gavin and I had an appointment with Dr. Trish. She thought that she would encounter a lot of chaos in Gavin after his seizure and hospitalization. She was happy to report at the end that he seemed to have processed the whole experience really well! Meanwhile on the table right next to him, his Mommy was filled with panic and fear which she said I was successfully able to clear by the end. I know all of this might sound crazy - and energy healer - but I can't express enough how much she has done for our family. I found this old video of Gavin from the summer of 2010 (he looks so little here!) if you are curious what his sessions look like. Mine look similar, but I'm on my belly on a chiropractic table. And I don't play with my feet. 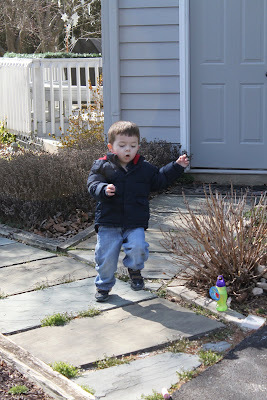 While we were at our appointment, Brian and Miss Sara went outside to play! It's a gorgeous day here. I suspect that I'll be packing away the winter coats very soon! Brian played with sidewalk chalk, played on the swings...and Miss Sara said he shocked her when he drew and "X" and "T" on his own. How cool is that?? ?